Learn Why a River Cruise is Your BEST Vacation... and BEST Value! 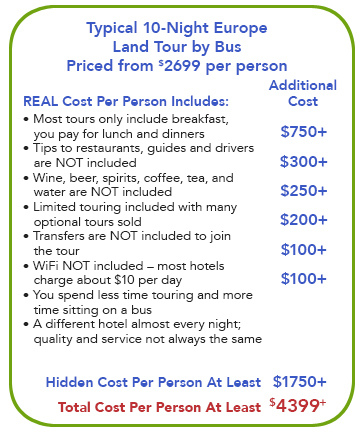 Don't be misled by low lead prices on land tours and ocean cruises! Is your head "spinning" after reading the comparison charts? Not an uncommon, first reaction! It's what we call “STICKER SHOCK!” But, don't worry... with our expert assistance, most travelers are quickly able to step back and examine the true costs of each of these vacation choices. Once they see all of the included features on a river cruise — which cost extra on an ocean cruise or land tour — they understand that, while a river cruise is never considered a cheap vacation, it offers them the BEST VALUE and the BEST destination experience! 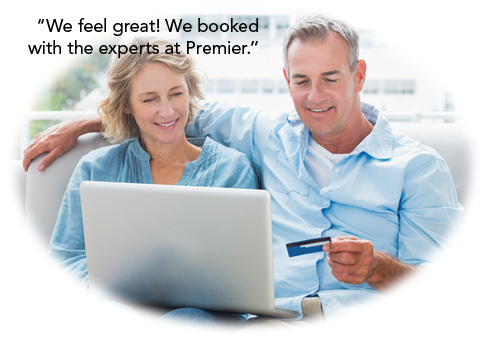 Give one of our expert Personal Travel Planners a call to get all the FAQs about river cruising at 1-855-255-1200! 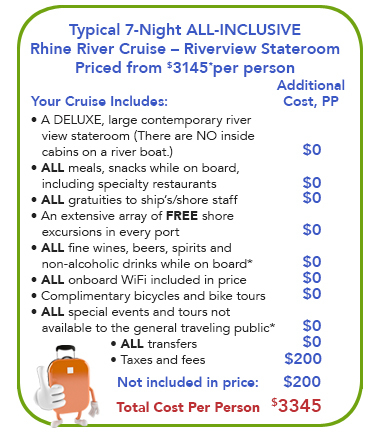 the true value of a river cruise over other vacation choices. *TERMS AND CONDITIONS Price is based on river view [window] stateroom. 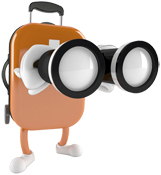 Some restrictions may apply and are specific to each river and small ship cruise line. Price comparison is based on select Euroepan Rhine river cruise departures. Other dates and departures may be slightly higher. 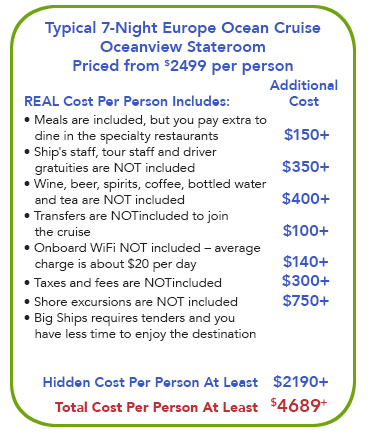 On cruise lines that are not “all inclusive,” beer and wine are only included at lunch and dinner. Airfare is additional on river cruises, ocean cruises and land tours. We reserve the right to correct any informational or typographical errors. ©2010-2019 Premier River Cruises, LLC. All rights reserved worldwide. CST #2104636-40.